When one thinks of the worlds biggest book fairs its unlikely Bangladesh is on the list of prime candidates, but in fact the annual Amar Ekushey Boi Mela in Dhaka is well up there in the running, not least for its duration. The boi mela lasts the entire month of February. 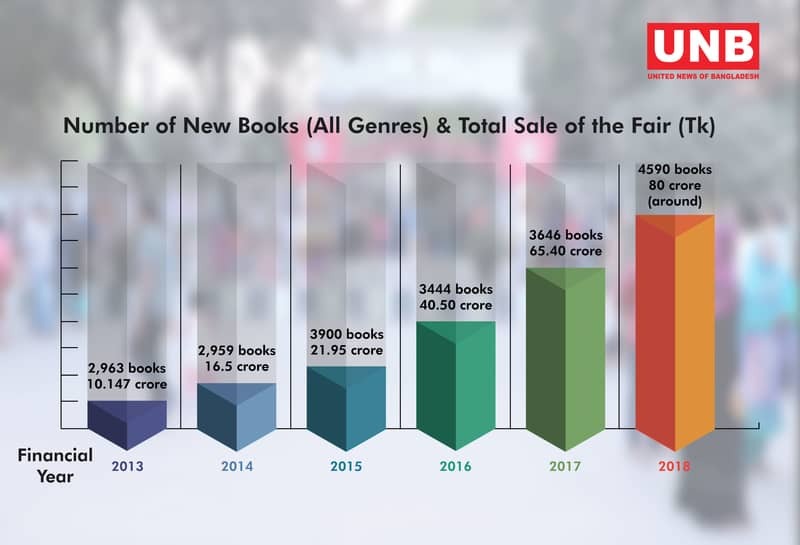 The annual book festival has been regularly breaking records for attendance and books sold – this graphic shows the number of books published and the value of sales over the past six years. As reported here at TNPS last March, that value equates to almost $10 million of books sold at the event in 2018. This year’s fair will be bigger than ever before and have a more reader-friendly atmosphere. Publishers have been allotted over 600 stalls and around 42 pavilions, and more than 100 stalls have been earmarked for government and non-government organisations. The Bangla Academy reports that publishers are working round the clock to get the books ready and promoting them on social media. And further that 4,591 new titles will hit the fair. The Academy has launched an online app for publications for the first time, and GPS has been added to assist visitors to locate their desired stalls. Bangladesh Prime Minister Sheikh Hasina will inaugurate the fair on 1 February while two honorary guests – Indian poet Shanka Ghosh and Egyptian writer and poet Mohsin Al Arishi – will grace the opening ceremony. I’ll end this post with a repeat of that quote from the Bangla Academy. Publishers are working round the clock to get the books ready and promoting them on social media. It’s one of those curious anomalies in the global publishing arena right now that nascent market publishers understand the value of social media to sell books, but have yet to embrace the logical extension of that understanding and to offer those exact same titles there and then in the social media promotion with a download link for the ebook. In fairness, in Bangladesh, at least, the big hurdle there is the absence of any of the Big 5 western ebook retailers, and the absence of any local or regional player to fill that void. But here’s where it gets crazy, the indifference of publishers and retailers alike is driven in part by the fact that internet penetration in Bangladesh only stands at 53%. Why bother offering ebooks if only half the country is online? The logic is impeccable. Impeccably flawed, that is. Because that 53% internet penetration in Bangladesh equates to 88 million people online. It means Bangladesh is already the 10th largest country in the world by internet users, with more people online that Germany, the UK, France or Italy, and twice as many as Spain. Yet the country is studiously avoided by the big western ebook retailers.